Boston Strong? opens at Galatea Fine Art in Boston's South End this Friday, October 3, 2014. It's First Friday, so come check out our work - then go check out several other shows in the same big 450 Harrison Ave. arts complex! For more information, click here. 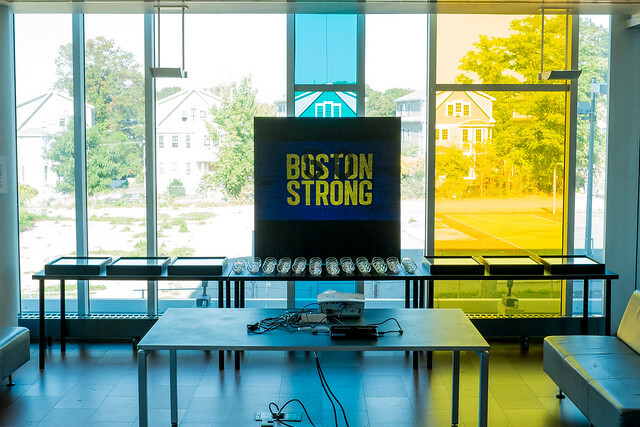 Here's a photo of Jason's Boston Strong? installation at the Grove Hall branch of the Boston Public Library. It was pretty much the perfect place to show it. Just in time for our Grove Hall closing event tomorrow evening, here's the video of our April 15 Community Opening - now live on YouTube. Enjoy!